Diary of an Aspiring Loser: I've Got a Plan. As much as time will allow I plan to ride my bike to the gym and to the pool. I rode today to my Weight Watchers meeting (more on that in a sec'), then to the pool, then home. I had to ride over a hill to get to the pool, the biggest I've ever climbed. It wasn't easy but I used the tips Katie gave me on my weekend ride and just pedaled and focused on short distances. Anyway, I rode a total of 7.7 miles. I had the experience of swimming and then biking too, which was an unexpected benefit (of course I left the pool, showered off the chlorine, changed back into my clothes and then rode home so it wasn't the speedy transition I'll experience in the tri but still). Miguel and I will continue to do stuff on the weekends so hopefully that will get my biking up to par. You know, all I really want to do is finish the triathlon and that's what I'm focused on. The thing that worries me the most is the 3.1 mile run. Jogging is still challenging for me and I haven't gotten up to even 2 miles yet. The thing going for me is that I will be all warmed up by the time I have to jog, but that's the downside too because I could be a bit tired. Anyway, I know I'll finish, even if I have to walk, but it would be nice to jog the run portion. Of course now I'm in the market for some "tri" shorts. They are like bicycle shorts but with less padding so you can swim in them. It's either that or swim in my suit and throw some shorts on after for the bike ride. I won't have padding that way though. Oh the dilemna (which is now apparently spelled dilemma, they changed it!). So these are the shorts I decided I wanted but they are sold out everywhere. Dagnabit! Rest assured, I'll be keeping you posted on all the shopping. Alright, enough already. Without further ado...It's weigh-in Thursday!! Woot Woot! Does all the fanfare give the idea I had a loss this week? Yes! I lost 2.4 pounds. Wow. Normally when I have a big loss (3.something pounds last week) I don't have one the next week. Well I'm hanging on to the 170's by a thread. Next week I might drop into the 160's, which would be great and also mean I'd lose a daily point. I'm actually thinking of doing my Points Quiz in a way that let's me keep the point. It has to do with how much activity you get during the day. I rated my activity the lowest because my job is a lot of sitting and driving. But since I'm doing all this exercising, now I'm thinking about upping it, which would mean 1 extra point per day. I don't know, we'll see. So last week I even went 4.5 points over in my points. See that red "weekly exceeded" number? Oh I hate that. Anyway, it didn't hurt this week. Balanced out by all the activity I imagine. Alright, I'm beat. Oh, and I changed my mind, blogging is therapy. So can I bill my insurance for my typing time? It's always amazing to me all the cool stuff out there for your sport! 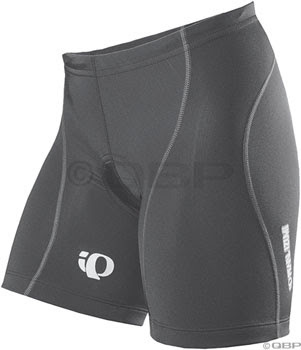 I like the idea of those shorts for a tri, just because it will save time. Yea on the weight loss - Congrats!!! I just realized you live in the Bay Area (but I bet you knew that :) One of my favorite places is in Walnut Creek, the Sports Basement. I order from there all the time. They have a great selection of tri stuff and good prices. Just thought I'd throw that out there. Hi -- new reader, I love your blog. It is so inspiring. One thought, I think exercising 4-6 times per week should count as much more than a single extra point! I don't know the WW system very well, but I do know that other calories per day calculators I've used have counted vigorous exercise 4xweek as a moderate to high level of activity. You need the fuel for your awesomeness! I would totally redo your points calculations. When I orignally joined I picked the lowest activity as well since I pretty much sit at a desk all day, then after a while I noticed my losses slowing to .2s and .4s and it was killing me. Well it ended up that I wasn't eating enough even though I would totally stay witnin my points and use the 35 extra. As soon as I redid the whole thing and got to eat more I started dropping more. I haven't read any other entries yet, but if you are totally working out then you NEED to eat more. I've added you to my blog and my google reader. Did I Mention I'm Doing a Triathlon?